JERUSALEM (AP) — Vice President Mike Pence is making a visit to the Western Wall and meeting with Israeli President Reuvin Rivlin on his final day of a trip to Israel. The vice president is also to visit the Yad Vashem Holocaust memorial before departing the Holy Land later on Tuesday. His visit to the Western Wall in Jerusalem’s Old City comes amid tensions with the Palestinians, who have assailed the Trump administration’s decision to recognize Jerusalem as Israel’s capital. 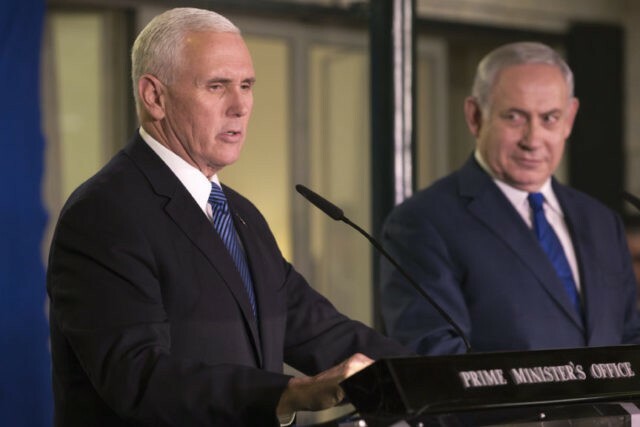 Pence addressed the Knesset and held meetings with Israel’s Prime Minister Benjamin Netanyahu on Monday, announcing plans to speed up the timing of the opening of the U.S. Embassy in Jerusalem to late 2019. Pence has traveled to Egypt, Jordan and Israel during his first trip to the Middle East as vice president.